LifeTime® Wood Treatment has been handed down for over 60 years through three generations of woodworking craftsmen. Family-owned and operated has made LifeTime® available commercially. We are proud to have made it possible for homeowners, contractors, and manufacturers to share in the time-tested benefits of this truly unique product. LifeTime Wood Treatment is a low maintenance environmentally friendly wood finish that gives a rustic, weathered look. LifeTime Wood Treatment is for all outdoor wood. 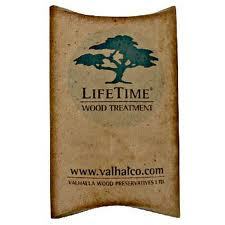 LifeTime Wood Treatment is nontoxic, environmentally friendly, and made from naturally occurring plants and minerals. LifeTime Wood Treatment comes in a powdered form making storage and shipping easy. LifeTime Wood Treatment goes on in one easy application by brush, roller, or spray. (It must be completely dissolved in warm water before spraying.) Initial color ranges from gray to light brown or olive brown, depending on the type of wood, but matures to a silver patina.Pigment obtained from your local hardware store may be added to give some color. (When using pigment, more maintenance will be required.) Note: LifeTime will turn the heartwood of Redwood and Hemlock very dark, possibly black. Made in Canada. Coverage: Approximately 160 sq. ft. per gal. To mix by the gallon use 4 tsp per 1 gallon of water.